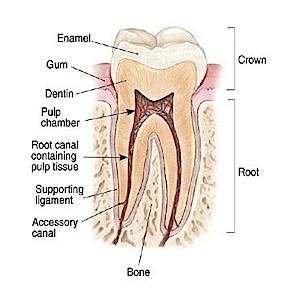 A root canal is a dental procedure that is done to treat damage or infection inside a tooth. Specialized dentists called endodontists do the most complex and efficient root canals. Endodontics is the branch of dentistry that focuses on diagnosing, treating and saving teeth whose internal anatomy of nerves, blood vessels, connective tissues or roots have been affected by injury, decay or infection. These specialists complete about three extra years of dental training in order to do these delicate root canal treatment procedures. Tooth decay that is beyond the outer layer called enamel and the inner layer called dentin. Treatment for complex and multi-rooted teeth such as the molars. When specialized equipment such as small files, digital imaging systems, microscopes and magnifying devices are required for treatment. To perform re-treatments of unsuccessful root canal procedures. To diagnose dental pain whose source is not readily identifiable. To conduct emergency root canal treatments. When you are ready for treatment, the endodontist will isolate the tooth using a dental dam; apply anesthesia to the area; access the pulp chamber by drilling a hole through the enamel; treat the area by removing the infected pulp; disinfect the area; then fill and seal the tooth. What happens if the tooth is not permanently restored? It protects the treated tooth from getting fractured. It alleviates any extra stress the tooth might incur when chewing food. It can restore the natural look of your teeth. It can replace extensively damaged and excavated teeth. It seals the tooth after a root canal procedure. It ensures the longevity of the tooth. Once the whole process is completed, you will need to exercise proper dental hygiene through flossing, brushing, and visiting the dentist occasionally for cleaning. It is normal for your teeth to feel a bit sensitive after the root canal. If that’s the case, you can use toothpastes designed for sensitive teeth. Any pain or discomfort should subside within the first week. However, if pain persists or you have any questions, you should consult your dentist immediately. The cost of having a root canal treatment depends on several factors. First, the fee will vary if the treatment is done by either a general dentist or an endodontist. You will also find that it is more expensive to treat pre-molars and molars than it is to treat frontal teeth. The prices don’t vary by much though. This variation is caused by the difficulty in accessing the root canals in the back teeth and in the complex nature of their root canals. Lastly, re-treatment fees for root canal therapy tend to be higher than the initial cost of treatment. This is because re-treatments require specialized skill and time to undo the damage caused by an unsuccessful root canal. Going to a certified endodontist in Boca Raton, like Dr. Mitchell, for the initial treatment is therefore more cost-effective and guarantees a higher chance of success. It is also important to note that there is a final cost you will incur after the root canal treatment since a general dentist has to permanently restore the treated tooth.